An impassioned sympathy inspirational gift is never easy to buy. For this hardest of times for people, Captured Wishes has created the Sacredness of Tears sympathy wish. Not showy, the careful balance of sentimental respect and inspiration will help your loved one to find strength and hope in the days and weeks following their bereavement. There is no time frame to speak of when facing the loss of someone you care about and the burden of this loss sometimes makes us feel very alone. 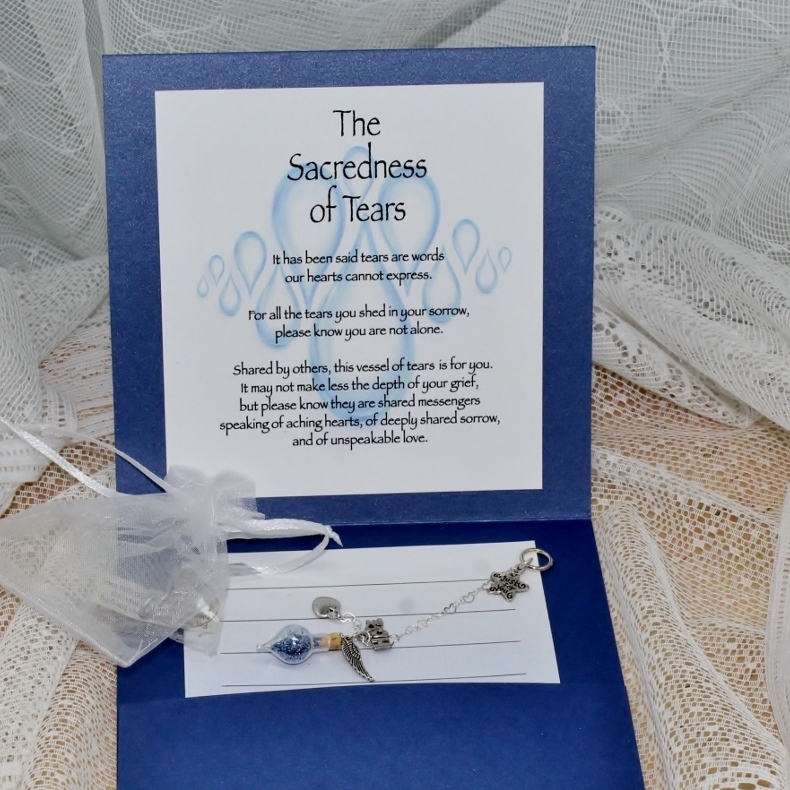 Although very tiny, this tear-shaped vessel is symbolic of tears shed by many and shared by all. The person who now grieves will be truly comforted in knowing the sorrow they feel has naturally divided and apportioned itself with others because they care. The teardrop vessel is filled with a mixture of turquoise blues, which hold energies for healing and recharging the spirit. This beautiful Captured Wish (height approx 30mm x 15mm width) is just the gift you need during this challenging time for your friend or family member. This entire package is as delicate and refined as the words that are used to describe it. Adding your signature to the bottom may just be enough, but there is room to write your own thoughts if you feel the need to make it even more personal.